Instant downloads of all 942 LitChart PDFs (including A Jury of Her Peers). 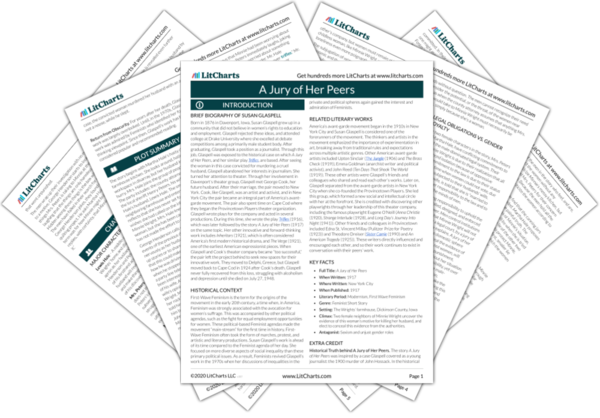 Welcome to the LitCharts study guide on Susan Glaspell's A Jury of Her Peers. Created by the original team behind SparkNotes, LitCharts are the world's best literature guides. A concise biography of Susan Glaspell plus historical and literary context for A Jury of Her Peers. A quick-reference summary: A Jury of Her Peers on a single page. In-depth summary and analysis of every of A Jury of Her Peers. Visual theme-tracking, too. Explanations, analysis, and visualizations of A Jury of Her Peers's themes. 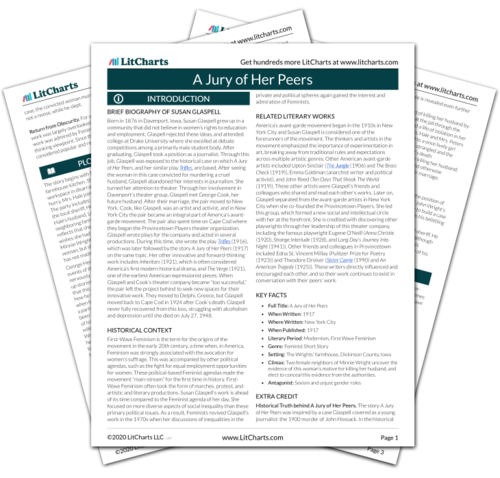 A Jury of Her Peers's important quotes, sortable by theme, character, or . Description, analysis, and timelines for A Jury of Her Peers's characters. Explanations of A Jury of Her Peers's symbols, and tracking of where they appear. An interactive data visualization of A Jury of Her Peers's plot and themes. Born in 1876 in Davenport, Iowa, Susan Glaspell grew up in a community that did not believe in women’s rights to education and employment. Glaspell rejected these ideas, and attended college at Drake University where she excelled at debate competitions among a primarily male student body. After graduating, Glaspell took a position as a journalist. Through this job, Glaspell was exposed to the historical case on which A Jury of Her Peers, and her similar play Trifles, are based. After seeing the woman in this case convicted for murdering a cruel husband, Glaspell abandoned her interests in journalism. She turned her attention to theater. Through her involvement in Davenport’s theater group, Glaspell met George Cook, her future husband. After their marriage, the pair moved to New York. Cook, like Glaspell, was an artist and activist, and in New York City the pair became an integral part of America’s avant-garde movement. The pair also spent time on Cape Cod where they began the Provincetown Players theater organization. Glaspell wrote plays for the company and acted in several productions. During this time, she wrote the play Trifles (1916), which was later followed by the story A Jury of Her Peers (1917) on the same topic. Her other innovative and forward-thinking work includes Inheritors (1921), which is often considered America’s first modern historical drama, and The Verge (1921), one of the earliest American expressionist pieces. When Glaspell and Cook’s theater company became “too successful,” the pair left the project behind to seek new spaces for their innovative work. They moved to Delphi, Greece, but Glaspell moved back to Cape Cod in 1924 after Cook’s death. Glaspell never fully recovered from this loss, struggling with alcoholism and depression until she died on July 27, 1948. 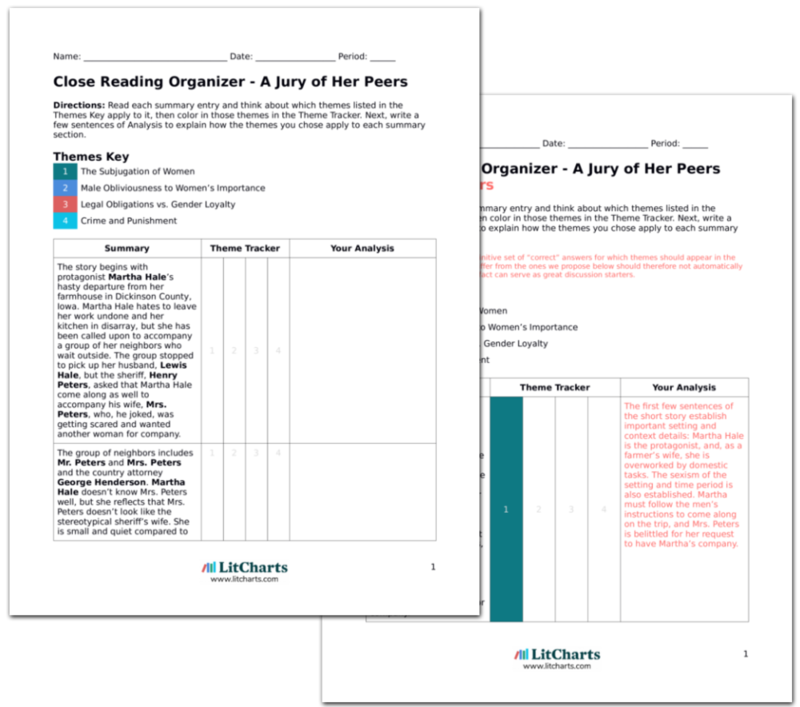 Get the entire A Jury of Her Peers LitChart as a printable PDF. First-Wave Feminism is the term for the origins of the movement in the early 20th century, a time when, in America, Feminism was strongly associated with the avocation for women’s suffrage. This was accompanied by other political agendas, such as the fight for equal employment opportunities for women. These political-based Feminist agendas made the movement “main-stream” for the first time in history. First-Wave Feminism often took the form of marches, protest, and artistic and literary productions. Susan Glaspell’s work is ahead of its time compared to the Feminist agenda of her day. She focused on more diverse aspects of social inequality than these primary political issues. As a result, Feminists revived Glaspell’s work in the 1970s when her discussions of inequalities in the private and political spheres again gained the interest and admiration of Feminists. America’s avant-garde movement began in the 1910s in New York City and Susan Glaspell is considered one of the forerunners of the movement. The thinkers and artists in the movement emphasized the importance of experimentation in art, breaking away from traditional rules and expectations across multiple artistic genres. Other American avant-garde artists included Upton Sinclair (The Jungle (1906) and The Brass Check (1919)), Emma Goldman (anarchist writer and political activist), and John Reed (Ten Days That Shook The World (1919)). These other artists were Glaspell’s friends and colleagues who shared and read each other’s works. Later on, Glaspell separated from the avant-garde artists in New York City when she co-founded the Provincetown Players. She led this group, which formed a new social and intellectual circle with her at the forefront. She is credited with discovering other playwrights through her leadership of this theater company, including the famous playwright Eugene O’Neill (Anna Christie (1920), Strange Interlude (1928), and Long Day’s Journey Into Night (1941)). Other friends and colleagues in Provincetown included Edna St. Vincent Millay (Pulitzer Prize for Poetry (1923)) and Theodore Dreiser (Sister Carrie (1990) and An American Tragedy (1925)). These writers directly influenced and encouraged each other, and so their work continues to exist in conversation with their peers’ work. Climax: Two female neighbors of Minnie Wright uncover the evidence of this woman’s motive for killing her husband, and elect to conceal this evidence from the authorities. Historical Truth behind A Jury of Her Peers. The story A Jury of Her Peers was inspired by a case Glaspell covered as a young journalist: the 1900 murder of John Hossack. In the historical case, the convicted woman murdered her husband with an ax, not a noose, while he slept. Return from Obscurity. For years after her death, Glaspell’s work was largely overlooked. Until, in the 1970s, Glaspell’s work was admired by Feminists who identified her forward-thinking viewpoint. Since then, Glaspell’s work has been considered popular and recommended reading. Champlin, Nikola. "A Jury of Her Peers." LitCharts. LitCharts LLC, 18 Jun 2015. Web. 18 Apr 2019. Champlin, Nikola. "A Jury of Her Peers." LitCharts LLC, June 18, 2015. Retrieved April 18, 2019. https://www.litcharts.com/lit/a-jury-of-her-peers.